The Berlin Boombox is a DIY portable mp3 sound system with a 1985 look and feel. The completely retro look is a corrugated cardboard cutout with electric snap on parts, so unlike your original 80s box, this one won’t break your shoulder while you’re strutting down the street in your Adidas and track suit. There’s a step by step instruction guide included with the box which is all you need to start building this little bit of retro fun time. It features two speakers to give a full range of sound and connects to your music playing device (e.g. your phone) via the headphone jack, making it compatible with any mobile device. The Boombox also runs on 3 AA batteries which is a huge step up from the 10 D size batteries of yesterday. The original is classic white but it also comes in a variety of other colors which include a blank case that you can color to make your own. 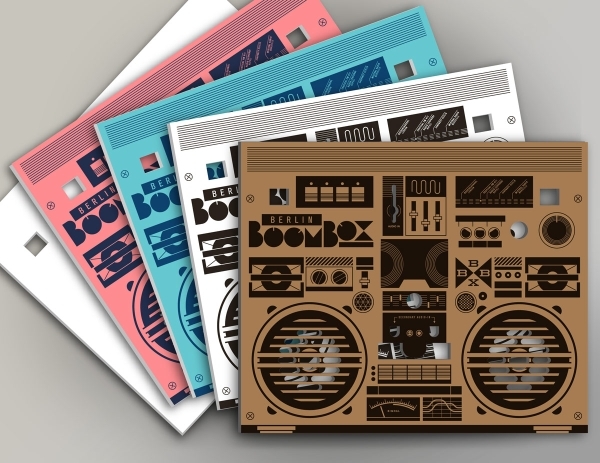 The Berlin Boombox starts at 65 Euros.